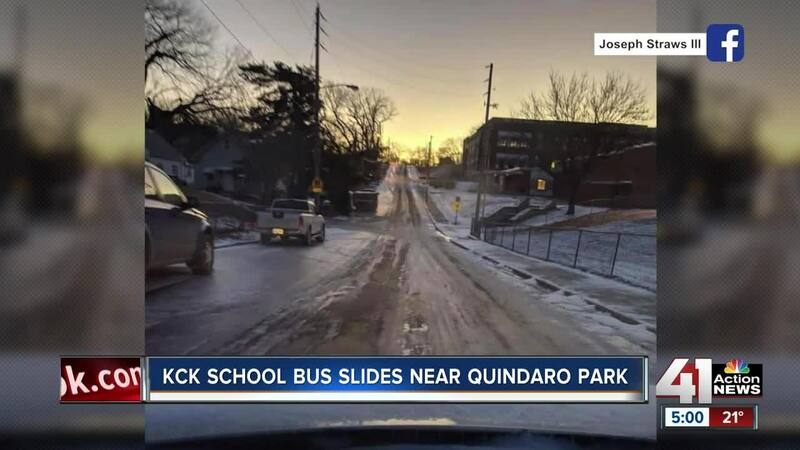 KANSAS CITY, Kan. — Although it wasn't an official snow day, many parents made a snow day of their own on Friday. Hundreds of parents were not happy with the Kansas City, Kansas Public School District's decision to keep school open, when nearly every other metro district had a snow day. Many parents called it "ridiculous" and "crazy." "It was pretty much dead-set that I wasn't going to allow them to go," said Jodi Stanton, who lives off K-32 in southwest KCK. "The buses have already had issues out here and the streets scare me." The district posted the announcement on its Facebook page the day before. Hundreds of comments from parents said they were not going to send their kids to school. The district had a snow day on Thursday. Sarah Graham lives in Turner on a hilly street. It had a thick layer of ice. She kept her kids home. "It's really slippery and icy," Graham said. "I'm not taking the chance of one of my kids falling and breaking a bone." Sarah Stone kept her son home from preschool. "It's too icy and too cold. It's a snow day," Stone said. "We can make it up in May versus having an accident today." Stone is a bus driver for the Shawnee Mission School District. She didn't have to work on Friday because the district called off. She says it's hard for buses to get around in icy conditions, especially with how hilly and curvy KCK streets are. Several parents sent pictures of icy streets to school board candidate Joseph Straws III. He said he was disappointed school was in session. One picture showed a school bus that appeared to have slipped or gotten stuck near Quindaro Park. 41 Action News reached out to the school district multiple times for insight into their decision to stay open, and we wanted to know if any buses had any issues getting around. The district did not return our multiple calls and emails. Superintendent Dr. Charles Foust was out of town at a conference on Friday. Graham says Foust needs to get in touch with the neighborhoods. "Drive around on the side roads and make sure," Graham said. "If they can’t drive and can’t walk, why should our kids have to?" The district recently updated its inclement weather guide on its website.